Our exclusive range of Children’s Tents has tents such as the Round Tents, Hut Shape Tents, Peak top Tents, Kids Tipis, Kids Viking Tents and Play Houses for Kids. Out door garden tents for Children are made in Canvas, while indoor play houses are made in organic Cotton sheeting. Most of the Children’s Tents are erected on Frames and are very stable structures, very easy to erect and dismantle, metal pipe frame with sockets. We provide an Erection Manual with every Kid’s Tent and children love to see the pictures and assemble their own Tent. For kids, it is fun to build their own tent and play in it ! This is the Round Tent, it can come on a frame, without any center pole, so that your child has all the inner area for playing. We also have the old school Round Tent that is erected on a Center pole, like our other traditional Big Tents and Medieval Pavilions. We have beautiful combinations of Pink & Fuchsia for Girl’s Tents and Greens & Blues for Boy’s Tents. We also give a matching Floor Mat with this Tent. You can also order a round shaped mattress for your tent and matching cushions and bolsters to complete the look of your Prince tent for Boys and Princess Tent for Girls. Every child loves to build his or her own Hut and play in it. That is what childhood is all about ! We believe in making a beautiful and safer play Hut for your child. This tent is erected on an easy to erect and dismantle metal pipe frame with sockets, very safe and sturdy for your child. The fabric cover is a one piece and just slips down the frame to make the Beautiful Hut Tent. This way, your child can have a little private room, inside your bigger room and play with her dolls and his action figures within the confines of their private Hut Tent. We also give a matching Floor Mat with this Tent. You can also order a rectangular shaped mattress for your tent and matching cushions and bolsters to complete the look of your Kid’s Tent. Inspired from the great and magnificent Taj Mahal, we have designed and developed this small Mahal, meaning Palace. The Tent Mahal for Boys in Teal & Blue color combinations and a Tent Mahal for Girls in Pink & Fuchsia colors is our Best seller Tent. 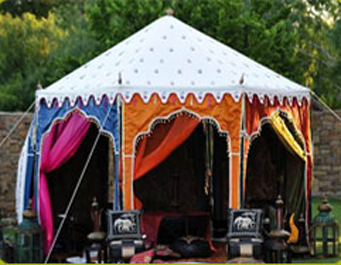 This tent has a back wall and curtains on three sides, to give the feeling of a Mahal to your child. So pamper your little Prince with this Tent Mahal for Boys and spoil your little princess with a Tent Mahal for Girls. 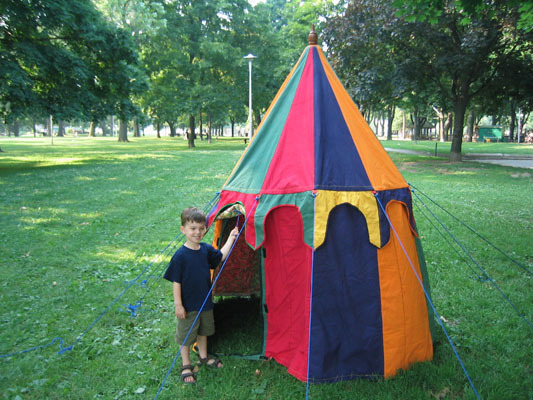 Keep this Tent in the Kid’s Room or outside in the lawn and let them just Play ! We also give a matching Floor Mat with this Tent. You can also order a Square shaped mattress for your tent and matching cushions and bolsters to complete the look of your Tent Mahal. Our tipis for kids come pre assembled and you just need to open the bag and put this tent on the floor. We also give a matching Floor Mat with this Tent. You can also order matching cushions and bolsters to complete the look of your Kid’s Tipi Tent. We have been very creative in designing all our Tents for kids and we are sure, that you will agree when you check out our entire range of Kid’s Play Tents. The printed Viking Tents and the Stripped Viking tents have been much appreciated by all our Little friends. We also give a matching Floor Mat with this Tent. You can also order a mattress for your tent and matching cushions and bolsters to complete the look of your Kid’s Viking tent.